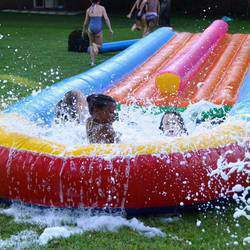 Venue hire is limited to 30 adults and 30 children only! We cater for kids parties, baby showers, kitchen teas and adult birthday lunch parties too. Just let us know what your function requirements are and we will make it happen! You have exclusive use of the venue - only one party at a time! 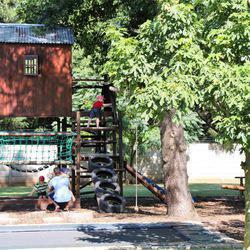 Hullabaloo has a beautiful rolling lawn with lots of shade and loads of fun things for the kids to do! - GIANT blackboard and much, much more! There are soccer goals and a netball hoop for those who would like to show off their ball skills....and don't forget about the ZIP LINES! ! A short 19m zip line for the not so big (age and weight restrictions apply), a 46m zip line for the brave and the monster 65m zip line for the crazy!Unfortunately this is for the kids only.......height and weight restrictions do apply! 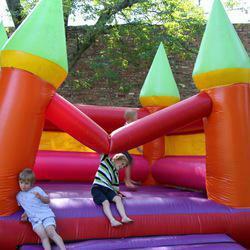 We also offer a standard jumping castle and a 10m double waterslide for the warm summer afternoons! There is a wood burning pizza oven where kids can make their own pizza's or we can make some large pizza's for you! Our extensive snack platter menu caters for all your party needs. We can even organise a game of Laser tag in our big garden with bunkers and all! And for the little chefs....decorating cupcakes or biscuits, transforming them into masterpieces! And who would not like to make their own chocolates mmmm.....!